What if... Alpha Authority and Two-Headed Sliver? Giving hexproof to an opposing creature? is hexproof cancel enchantment ? There's a lot of really good cards that increase the number of counters that you're not using yet - I think especially cards that double counters like Solidarity of Heroes , Kalonian Hydra and Biogenic Upgrade could be quite deadly. Also anything that lets you proliferate each turn, like Contagion Clasp and Contagion Engine , and maybe Plaguemaw Beast or Throne of Geth . 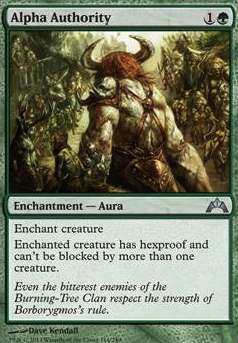 Primal Vigor and Doubling Season double the number of counters coming in, and Increasing Savagery just immediately gives you loads. 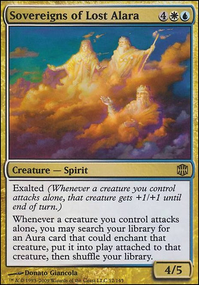 For more Kicker spells, a Scryfall search should suffice, but one that stood out to me was Everflowing Chalice , as it's very cheap and helps you ramp. One weakness I see in this deck is that your commander is pretty easy to remove, and then you lose all those counters! Alpha Authority , Swiftfoot Boots , Champion's Helm or Mask of Avacyn could help you protect him. This deck looks pretty good. Similar to my own Vultron-ish Skullbriar deck. Yahenni, Undying Partisan is another hasty +1 counter creature that has built-in protection. Suspicious Bookcase , Canopy Cover , and Prowler's Helm are other ways to get Skullbriar and friends through enemy defenses. Nim Deathmantle , Journey to Eternity Flip, Supernatural Stamina , Stitch Together and Unearth are great graveyard recursions (especially because Skullbriar keeps counters even in the graveyard). Eternal Thirst , Feast on the Fallen and Predatory Hunger might be good +1 counter editions depending on your group's meta. If you can afford it, Doubling Season doesn't help your opponents like Primal Vigor does and it has the same effect. 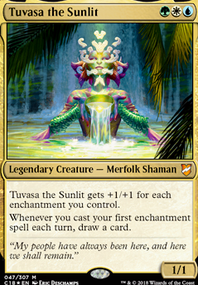 Vraska, Regal Gorgon might have a bit higher CMC, but I think fits your deck a little more than your current Vraska. Assassin's Trophy , Windgrace's Judgment and Beast Within are good removal spells in Golgari colors. Finally, Sword of Vengeance , Pelt Collector , Lightning Greaves , and Alpha Authority are just overall good cards that you might find helpful in your deck. This deck looks super fun, but I do have a few concerns. A lot of this is going to depend on the playgroup you encounter, so take it with a grain of salt. The two main issues I see are EDH-specific removal and go wide decks. Lets look at removal first. 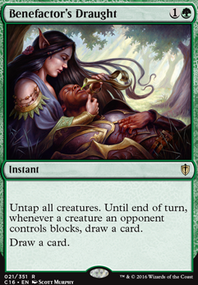 Obviously in a green deck, the ramp you will be getting is going to make it very easy to just regenerate or recast your commander if you need to, but many players run removal that doesn't put your commander back to the command zone. I'm a filthy blue player, so the immediate example for me is Imprisoned in the Moon , but think things like Pacifism , or even Mind Control or Act of Treason effects. 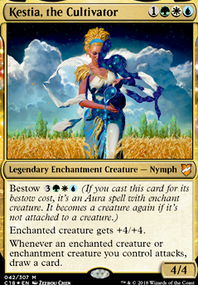 Currently, you only have 4 cards that protect against this type of removal in Alpha Authority , Canopy Cover , Swiftfoot Boots , and Krosan Grip . All of these except for grip are only options that work if you preemptively draw and play them, they cannot save your commander if he is already under a bit of removal. That would be fine, but with only 4 pieces of protection, your chances of drawing and playing them before your opponents can respond to your commander is not actually super great. That means you might be staring down a game where your only creature is stuck as a land, or just unable to attack. I would definitley consider trying out either more protection style enchantments, or running something like a sacrifice outlet i.e. Ashnod's Altar . Altar probably isn't the best choice for mono green, but its the first thing I could think of. 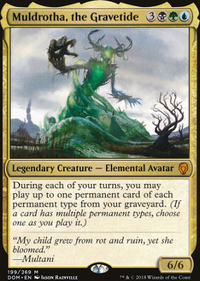 If you wanted to run more creatures I would recommend trying out something like a Birthing Pod or Evolutionary Leap , but if you want to keep the count low the other option is to run more enchantment removal. Krosan Grip is a good choice, but if you are banking on going tall, you need more ways to defend your dude. With commander damage being a thing, you should be in a good spot to close out the game with only 2 or 3 enchantments on your commander, so I would prioritize more slots to protection to actually be able to swing in. Go wide decks might be another big issue. 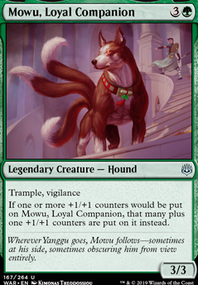 Going up against a Krenko, Mob Boss or a Marath, Will of the Wild , even trample might not be enough to get through chump blocks. You are also open to a blowout by just not having enough blocks to stop your opponent. If they swing with 10 tokens and you can only block one, you aren't really going to be alive very long. You do have some Fog effects, but that's potentially not going to be enough on its own, and again it falls into that issue of only being one or two cards in your deck. Something like Silent Arbiter could help out in this aspect. Arboria could be a neat include too once you have your dude suited up. you won't have to cast spells after you have a beefy commander, but your opponents will eventually have to do something, opening them up to attacks. Elephant Grass could be another option, as a token deck probably won't want to pay 10 mana just to sneak in 5 damage. Also, if you end up doing any playtesting, keep note of what your deck struggles with and feel free to add it to the description. Having a list of problems to tackle helps out a lot in strengthening decks, and it helps commenters stay on the right track a lot easier. This deck does look super fun though, so definitely let me know how it goes in any future games! I know the struggle of keeping your commander on the field, especially in pods. Canopy Cover + Alpha Authority + Glaring Spotlight + Sylvan Safekeeper all help protect and attack.